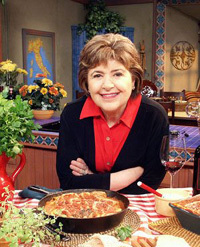 Mary Ann Esposito is the host and creator of the television program, Ciao Italia with Mary Ann Esposito, which has been on the air since 1989 and is America's longest-running cooking program. With roughly 1.4 million weekly viewers, Ciao Italia is viewed on more than 270 PBS stations nationwide, and is also seen in New Zealand, and Japan. This program is produced by Rhode Island PBS for national distribution. Mary Ann Esposito is the author of 10 cookbooks, including the best-selling titles: Ciao Italia, Nella Cucina, Celebrations Italian Style, What You Knead, Mangia Pasta, Ciao Italia  Bringing Italy Home, Ciao Italia in Umbria, Ciao Italia in Tuscany, and Ciao Italia Pronto! : 30-Minute Meals from an Italian Kitchen. Her most recent cookbook, Ciao Italia, Slow and Easy, was published in fall 2007 by St. Martin's Press. More than 1000 of the recipes found in her books can be viewed at http://www.ciaoitalia.com, the television show's companion Web site. There, viewers may also watch video clips of recipes preparation and tutorials. Mary Ann is a native of Buffalo, NY. She has been featured in USA Today, Family Circle, Better Homes and Gardens, La Cucina Italiana, TV Guide, Yankee Magazine, Coastal Living, Quarterly Review of Wines and metropolitan newspapers across the country. Mary Ann Esposito has appeared nationally on PBS' Victory Garden and Simply Ming, NBCs The Today Show, ABCs Live with Regis and Kelly, Discovery Channels Home Matters, Lifetimes Our Home, Food Network. She has also been heard on the Sirius network's Martha Stewart Morning Living radio program on the Martha Stewart channel. Among the organizations that have honored Esposito are: The National Italian American Foundation, National Organization of Italian American Women, The Columbus Foundation, and The Pirandello Lyceum, Washington, D.C.
She is currently a spokeswoman for King Arthur Flour.